With smartphones transforming into more and more potent computing devices, it makes sense that we want larger screens than before. After all, a 3-inch display will hardly allow you to be very productive -- items are too small, and your fingers are just too big. This has caused some serious growth in device's dimensions, with 5-inches now being something of an average across the industry. And while those larger screens definitely come in handy, they can also be quite frustrating to handle with one hand, whenever you just need to perform an operation quickly -- like calling your mom. God forbid you need to reach for the status bar to pull down the notification panel. In other words, it's safe to say that features, such as the special one-handed mode available with the 6-inch LG G Pro 2, comes in handy. Unfortunately, such perks are still far from the norm with manufacturers, and it's very likely that your phone doesn't have such a mode. Well, today, we'll show you how to mod just about any device with Android 4.0+ and get a one-handed mode, and it's quite straightforward, too. As you can guess, you'll need to be rooted in order to install the Xposed framework -- a wonderful platform that allows all kinds of customization of Android -- and then use its app to download a specific module. Sounds simple enough? It is. First of all, you'll need to download and install the aforementioned Xposed Framework, developed by XDA developer rovo89. You can download the .apk from here. It's best that you download it directly to your device, though nothing is stopping you from simply loading it on your phone through your computer in a way that you find most convenient. Once installed, just navigate into the app and follow the steps highlighted on the image to your left: Go to Framework > Install/Update > Grant Superuser privileges to Xposed. A few short seconds later, the framework will be installed onto your device. You now need to reboot for the changes to take effect. Once your device boots back on, fire up Xposed Framework again. Click Download and then click the magnifying glass (on top) to perform a search. Type in "One-handed mode", select the first (and only) result, and scroll down to locate the Download button. Now just install the OneHand Mode like you would any other app. After that, navigate to the home page of Xposed and click Modules. Once there, tick the box next to OneHand Mode. You'll need to reboot again for the module to become active. 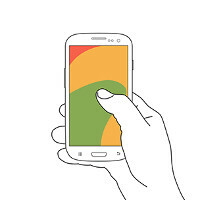 Once back online, search for the OneHand app in your drawer, and launch it. You'll be met with a menu like the one in the picture. In order for the app to know how small you want the windows to be, it needs your input (in pixels). For example, as righties, we use 200 for Left Margin, and 250 for Top Margin. Click Apply and exit the app. Your homescreens should now appear re-sized, and nudged to the bottom right of the screen. You can now use your device with one hand. Check the next few slides for an example. Whenever the mode is active, you'll find a (removable) notification in the notifcation panel. You can use it to quickly toggle the mode on and off, or you could use the secondary app (OneHand Toggle) that comes with the module. Xposed FW should be App of the year, EVERY year. It is an amazing app! Enough of this one handed operation bull**** Even on my iphone5 I still find myself using two hands in most situations. Why is the media forcing everyone to believe two handed operation on mobile is wrong? Is it because Apple hasn't gone big screen yet? It's becoming annoying. I used two hands to type this on my iPhone 5. Enough already. Er some people just like the convenience? For me there are so many occasions where I will be using one handed operations, such as when I'm holding something on the other hand? It annoys you that they give people an option that you don't use? That makes it BS? Get over yourself, sweetheart. While I agree one handed smartphone use is really overblown.....because even with the orig Droid I used 2 hands....one to hold the phone steady....its nice to have options...choices. If more ppl really paid attention...they might find they use 2 hands the most. Most of the time I'm using my N5 one-handed, since I only use the keyboard. Also gestures help a lot. But I use two hands as well and I don't consider it a burden at all. One handed use is overrated for phones in the 5" category. As long as your fingers can wrap around the device to hold safely. I found myself typing with two hands, taking pictures, pinch and zooming, gaming etc with two hands. Anything bigger than 5" (bar the LG G2) tends to have a very large chassis and holding the phone comfortably or ergonomically becomes very annoying. Look at the s5, the M8 the Z2... all larger footprint than the G2. The Galaxy Nexus was the perfect balance. As I agree about the big inconvenience. and that most of the time ppl use both hands, even on iphone,- the one hand functions on the Note makes the one hand use possible if needed. My Note 3 is still usable with one hand despite the large size, and I hardly end up using the one-handed feature anyways. Forget about all these stupid one-handed modes. Give me back my trackpad!